The Florida Department of Agriculture and Consumer Services’ Division of Food, Nutrition and Wellness has announced household size and income guidelines for free and reduced-price meals or free milk for students unable to pay the full price for meals or milk served under the National School Lunch, School Breakfast and Special Milk Programs. 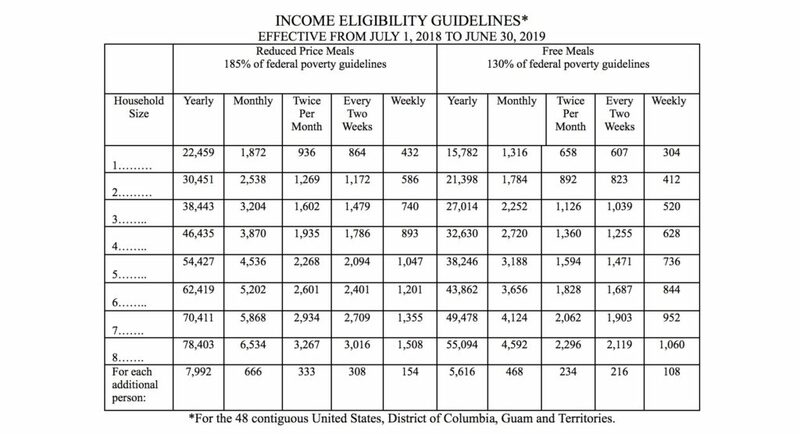 The guidelines of eligibility are in effect as of July 1, 2018, through June 30, 2019. Children from households that meet federal guidelines are eligible for free or reduced- price meals or free milk. SNAP / TANF HOUSEHOLDS: If a household currently receives Supplemental Nutrition Assistance Program (SNAP) or “Temporary Assistance for Needy Families” (TANF) for any child or other household member, they need only to list the child’s name and SNAP or TANF case number, and sign the application. ALL OTHER HOUSEHOLDS: If a household’s income is at or below the level shown on the income scale, children are eligible for free or reduced price meals or free milk. Households must provide the following information: (1) the names of all household members, (2) all household income last month and source of income received by each household member (for example, EARNINGS, WELFARE, PENSION, or OTHER). Income is all money before taxes or anything else is taken out, (3) the signature of an adult household member, and (4) the last four numbers of the Social Security number of the adult signing the application. The information on the application for free or reduced price meals may be verified by the school or other officials at any time during the school year. The information households provide will be treated confidentially and will be used only for the eligibility determinations and verification of data. Households may apply for benefits at any time during the school year. If a household is not eligible now, but has a decrease in household income, an increase in household size, or a household member becomes unemployed, an application should be filled out at that time. Foster children are eligible for free meal or milk benefits regardless of the household income. If a household has foster children living with them and they wish to apply for meals or milk benefits for them, they should contact the school for help with the application. Children enrolled in the Head Start/Even Start Program or the Migrant Education Program or who are considered homeless or runaway by the school district’s homeless liaison should contact the school for assistance in receiving benefits. Under the provisions of the policy, a local school food authority official will review applications and determine eligibility. Households dissatisfied with the ruling of the official may wish to discuss it with the school. Households also have the right to a fair hearing which may be initiated by contacting the hearing official in the local school food authority.